This has been a good weekend. We had a relaxing Thanksgiving celebration at home; I have completed 95% of my holiday shopping, including the wrapping accessories (although I have yet to wrap a single package); and I took time out to read and surf the internet. I think I am back into the blogging routine again (not quite sure why I ever got sidetracked – but I need to be careful to never allow that again. I like blogging too much to quit cold turkey). I have so enjoyed catching up on some of your posts, but I must confess that I was a bit surprised to discover so many reading challenges already developed for 2010. I think I have a love/hate relationship with Reading Challenges. On the one hand, they are so tempting! I am amazed at the wide variety and choices available. There are challenges to appeal to my current interests, and there are challenges that well….challenge me to read outside my comfort zone. I think I spent over an hour reading all the new posts on A Novel Challenge and I made a list of over 10 challenges that I would be interested in joining. On the other hand, I have not done well with the 11 challenges for which I signed up in 2009. Of those challenges I have only completed 4 (RIP IV, Shakespeare Summer Challenge, Support your Local Library, and Just for the Love of Reading); I reached the 50% mark in 3 challenges — one was the challenge that I sponsored (Summer Vacation Reading, Casual Classics, and TBR Lite), I read fewer than 50% in 1 challenge (Cozy Mystery) and embarrassingly sad to say, I did not read one single book in 3 challenges that I was eager to join (Everything Austen, 18th and 19th Century Women Writers, and Harry Potter). It would be very easy for this perfectionist to view these stats, admit failure, and vow never to join another reading challenge again. However…..that will not be the case. I find that the community aspect of reading challenges adds a social element to the reading experience that I enjoy. I thrill at the thought of looking through my bookshelves (or browsing through the library website) to make a list of potential reads. I marvel at not only the vast number of books that I have already read — but the seemingly endless number of literary genres with which I am totally unfamiliar. And I take comfort in the fact that there are others out there who enjoy my favorite past time as much – or perhaps even more than I do. My family does not understand my compulsion in this area (they tend to lean more in the direction of movies and music rather than the written word), and the appeal of being a part of a group who understands this side of my personality is uplifting. A Dog Named Christmas by Greg Kincaid (I just heard that the author will be at my local library on December 7. I have signed up for the event and very much looking forward to hearing him in person). The next 3 weeks will be stressful in my teaching life. We have two weeks of classes and a week of finals. There are 15 research papers to grade, umpteen last minute worksheets to review, and then the final exams. I want to make the conscientious effort this December, however, to keep a better balance of life. I did not do so well in November. May you all enjoy this final day of the Thanksgiving weekend, and relax and celebrate the holiday season with peace, love, and joy in your hearts. Review: Who the Hell is Pansy O'Hara? What I love about reading challenges is that I end up reading genres that I don't normally pick up. I like expanding my reading habits. I have not done well meeting my challenge goals, but I've had a great time trying! I'm trying for a more balanced December too! Good luck! I'm a sucker for the challenges. I think I'm going to sit down and strategically figure out a few today (try to make one book count for several challenges). Totally impressed you have your shopping almost done. That is the one thing I'm slacking behind on. I'm hoping to get a jump this week. BTW, isn't Hallmark doing "A Dog Named Christmas" on TV tonight? Holy Moly, 95% of your Christmas shopping done!!!! Congratulations! I think that qualifies as completing another reading challenge. Oh, reading challenges. They are so addictive. I think as a book lover it is the list making and thoughts of how many books we can read that intice us. When I first started reading challenges, I failed miserably and swore I'd never do another one. Well, I did sign up for more and finally completed my first challenge, so now I'm hooked! 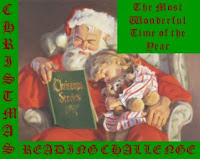 Good luck with the Christmas reading challenge! Completely understand your ambivalence about challenges. I seem to be successful only about half the time and am not sure why. I do enjoy the group reads of single titles a bit more, and the chance to connect in a conversation about a specific title. Good luck with that end of semester load. Have been there myself more than I care to remember and it always seems so daunting when coupled with the holidays. But you seem pretty organized on that front already! Happy reading! This was nearly the topic of my post today, too! I also have very mixed feelings about challenges. I love them, but hate not finishing them all. Still trying to come up with my plan for 2010! I feel your pain about the end of semester grading; the next three weeks will be a madhouse of paper grading and complaint-hearing and extra-credit-begging. 🙂 I have 137 students turning in 10-12 page research papers simultaneously. I shudder to think. I'm trying to pick carefully in 2010 to get a nice mix but that are doable! I think I'm about 95% done with my Christmas shopping as of now too. I got this crazy notion in my head that I needed to get most of it done in one day. Haha I haven't wrapped anything yet or prepared it for mailing. I have so much wrapping stuff left over from last year, so didn't need to worry about that this time around. I'm horrid at completing challenges! The only ones I seem to succeed at involve either numbers or are very open and books I like to read anyway. I like to make myself lists of books to read, I'm just very bad at following through. Best of luck with your stressful weeks ahead; I hope you achieve your goal of balance!